I love that ultimate is self-officiated, even at USA Ultimate Nationals. 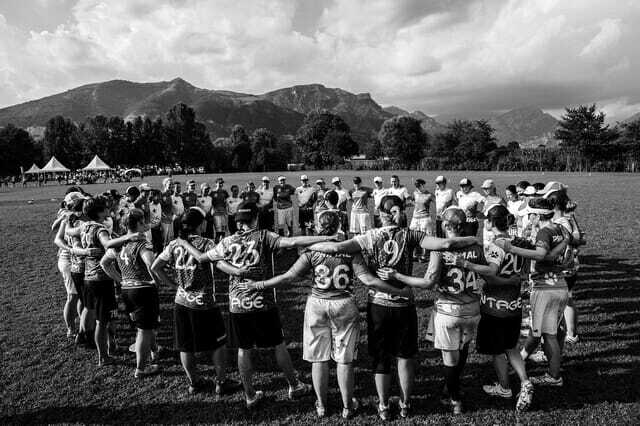 It is – without question – something that makes ultimate very different from every other major sport. At the youth level, it is incredibly important because it becomes the lens through which ultimate players talk about fair-play, and it has the added benefit of keeping costs down which should make ultimate a very easy sport for under-resourced districts to adopt. And, yet, we still see very little youth ultimate played outside of white middle-class and upper-middle class areas. And as a player and a coach, I left that clause unexamined for many years. But I can’t anymore. There’s nothing wrong or bad with the first part of the clause, but as I hope to take apart in this piece, the second part is deeply, deeply problematic when it comes to how that manifests on the field, in how we talk about and teach it, and in who feels welcome to play our game. I’ve been in the room when ultimate officials – local and national – have talked about how the sport is better than others because of SOTG. And I’ve heard coaches and organizers say, “When we get players from other sports in, we have to teach them how to act on the ultimate field.” I’ve coached youth ultimate, soccer, and basketball, and ultimate does not corner the market on fair-play. Not even close. And we do damage when we think we do. There are two problems with that attitude. First, it blinds us. Arrogance and critical self-reflection do not go hand-in-hand, and, as a sport, we need some critical self-reflection. And two, if a mostly white group of athletes and coaches have a holier-than-thou attitude about their sport, that’s going to come across really poorly to a lot of athletes of color when they start playing. To that end, I want to look at the video on Spirit of the Game that USAU puts out as part of its coaching re-certification program. This is a video, narrated by Jon Sandahl and Christie Lawry, about SOTG that all coaches must watch if they want to be a USAU-certified coach. Before we examine the video, we need to look at a few terms so that we are working with shared definitions about racial literacy and the way that we talk about race. If you want to test yourself to see what – if any – implicit biases you may harbor, go to Project Implicit, run by Harvard, and you can take any of the tests they offer. Be aware – it can be really uncomfortable to examine the results of the tests, but understanding our own implicit biases is both hard and necessary if we’re going to create the conditions by which our sport gets better on issues of race. And we have to be willing to admit we’ve got work to do both as a sport and as individuals. Let’s start with the intro montage. By my count, there are over 50 ultimate players in those first 18 seconds of footage, and there are, by my count, three players who I could visibly identify as a player of color and zero coaches. The effect of the montage is that it presents ultimate as a very white sport — and this montage is used in all four of the coaching videos. Representation matters. I cannot imagine using these videos to recruit coaches of color or players of color. And as the coach of a diverse team, I was angry and hurt that USAU thought this was an appropriate opening montage to four videos I was mandated to watch to renew my coaching certification. Ultimate has a long tradition of good-natured heckling. Heckles are friendly barbs, typically from non-playing spectators. Heckling can be fun, but taunting is unspirited and wrong. Harassing remarks after an opponent’s foul call or close play are NOT heckling: they are abusive taunts which create unpleasant playing conditions and often escalate to acrimonious disputes. Think about how implicit bias would influence — does influence — how each of these celebrations are judged. Happy celebration or “belligerent aggression” – implicit bias tells us that a white player will often judge the celebration of players of color more harshly, and in ultimate, we codify that with ‘spirit scores’ as a way to judge, rate, and sort SOTG. At SLA, we’ve played against predominantly white teams that storm the field after every point, spike, and make comments from sidelines, but those same teams have made comments about our spirit and our aggression when we engaged in similar behaviors. Last season, a predominantly white team came on the field after every point they scored, but we mounted a comeback and when our kids ran on the field after we scored, we heard the very tired refrain of “you guys have bad spirit.” And so many coaches who have teams with a significant number of black and hispanic players that I have ever spoken to have had similar experiences. There’s a reason that Masterman – one of the only other public schools from Philly with an ultimate team – roots for SLA whenever we play anyone from the suburbs. Because we both know. The next issue that I want to highlight speaks to the notion of cultural competence, and that’s at 2:30 in the video when they talk about the Golden Rule. This is a classic case of lacking cultural competence in assuming that all athletes come to ultimate with a shared definition of how we want to be treated on the field. That can highlight racial and cultural differences. And it’s what’s expected on that court. Every player in that game expects to get taunted if they get dunked on. (I know. I have been. Many times.) Every player knows that someone is going to give you grief if you call a foul every time you drive the lane. And every player knows they are getting talked to if they foul a guy three times in a row. And the thing is that pickup basketball culture is just as beautiful, meaningful, and fun as ultimate, as are the kids who play it. Yet very few of those behaviors would be considered “spirited” by the overarching (white) ultimate culture. But that’s the way a player coming from the culture of city pickup basketball would want to be treated. And we should and must create space to seek and find common ground so we can see each other and play together. The Golden Rule – as it is explained in the video – starts the process of reinforcing a very narrow, privileged, white, suburban view of what appropriate behavior looks like throughout this video. And, again, that’s incredibly damaging to any efforts to make our sport more welcoming to athletes of color. The next moment I want to highlight is at 3:26 when the coaches say, “Spirit of the Game is about how to…adjust your tone in the moment.” This is a particularly race-blind comment to make. Within the language of social and racial justice, there is such a thing as tone policing — when someone tries to discredit an argument by attacking the tone with which it is made. This plays into the stereotype of the “angry black man” or “angry black woman.” To not understand the context for that is to further brand this video as speaking only to white people. And it happens again at 5:31 when Jon and Christie talk about celebrations. They state, “Be aware of how your team’s celebrations are perceived by others.” Again, what if others are coming to the field with implicit bias? What if they are judging the actions of a team with many players of color differently than a white team? Why is the impetus on the players to control how others perceive them? Why do we assume that players of color must be the ones to sacrifice their cultural norms around how they celebrate? It’s funny, at 7:20, the video says, “Be a consistent role model.” That’s what I’m trying to do. I’ve seen how much the implicit racism of ultimate has hurt my students. I started coaching high school ultimate in 1996 in New York City with a wonderfully diverse team, and I’ve seen ultimate stay consistently and stubbornly white, even as the numbers of people who play have grown and the exposure people have to the game has exploded. And I’ve seen the thing that we hold up as sacrosanct – Spirit of the Game – hold us back because of the way we venerate it as making our game better than other sports and the way we frame it to players with a decidedly white lens, as I hope I’ve shown in this article. And finally, I want to go back to the moment that is most crushing to me. At 5:52, Christie Lawry says, “Teams that acquire poor reputations often have to work for years to overcome that image.” Yes, USAU, we know. Try being the only majority player of color team other teams face. Try feeling — over and over again — that you’re being judged as outsiders and that the calls never seem fair and the comments always loaded. Trying feeling – again and again – that your team gets chastised for behaviors you see from other teams that are just “energetic” or “passionate.” And then try knowing that your spirit scores are seemingly always low, no matter how many micro-aggressions you were forced to endure. Comments on "On Ultimate And Race: Spirit Of The Game"